I found the cutest set of Termocrisa snowflake dishes at Goodwill the other day and thought they would be perfect for the holidays. BUT, damn Goodwill wanted $2.99 per plate. Uh, no. Don't need them that much. 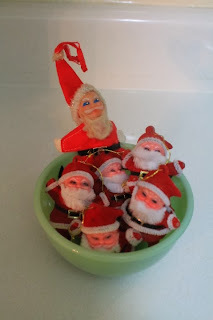 Oh yah, and I love how those Santa's look in the Jadeite bowl. Not flocked up at all. Great finds! And also you're not the only one who buys Thermocrista... I do! They have some great patterns. They are so flocking cute. Great finds! I am so happy you have joined us at Rednesday. Hope to see you next weekend..oh and I'm your newest Friend. I was so flocking confused for a second there! Hahahaha, you crack me up! Great finds!